Students at the 2018 Arts Midwest Conference. Photo by Joshua Feist. Arts Midwest is doing more than ever to make students feel at home at the Conference, because we recognize them as valuable and integral players in our future; especially in the arts. We are enhancing resources and programming for students to empower those who will go on to be leaders in the field, and to cultivate a greater appreciation for the arts. Undergraduate and graduate students are encouraged to attend the Conference on their own or with a faculty member, and interested students do not have to major in arts management or performing arts. The future of the performing arts lies in the hands of upcoming generations and college students, so it’s our mission to provide them with the tools to be leaders in the field, and for them to graduate with a greater appreciation for art and live performances. 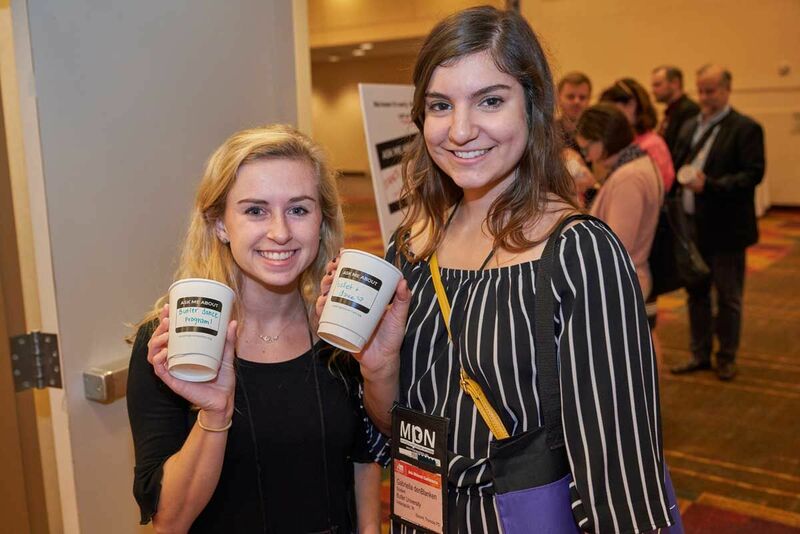 The Arts Midwest Conference is an experience that fuels students’ energy for the entire year, which spawns greater interest and investment by students in live arts engagement on campus. It can also be a springboard to a greater appetite for live arts for the entire campus. The student input and feedback that this involvement generates may also help you, as a presenter, to craft a diverse and compelling roster of events. If students aren’t a part of the process for what we bring to our campuses, how can we expect them to fully engage?